The Indian Air Force’s falling end strength and problematic force structure, combined with its troubled acquisition and development programs, threaten India’s air superiority over its rapidly modernizing rivals. The Indian Air Force (IAF) is in crisis. Despite being a world-class combat arm, the IAF’s falling end strength and problematic force structure, combined with its troubled acquisition and development programs, threaten India’s air superiority over its rapidly modernizing rivals, China and Pakistan. Indian air dominance is vital for deterrence stability in southern Asia and for preserving the strategic balance in the wider Indo-Pacific region. Resolving India’s airpower crisis, therefore, should be a priority for New Delhi. The IAF’s fighter force, as of early 2016, is weaker than the numbers suggest. At nominally 36.5 squadrons, it is well short of its sanctioned strength, and many of its frontline aircraft are obsolete. China and Pakistan field about 750 advanced air defense/multirole fighters against the IAF’s 450-odd equivalents. The airfield infrastructure limitations in Tibet, however, prevent China from bringing all of its air capabilities to bear against India. Yet after 2025, China could be able to deploy anywhere between 300 and 400 sophisticated aircraft against India, in addition to the 100 to 200 advanced fighters likely to exist in Pakistan by then. The IAF’s desire for 42–45 squadrons by 2027—some 750–800 aircraft—is compelling, if India is to preserve the airpower superiority it has enjoyed in southern Asia since 1971. The IAF’s likelihood of reaching its 2027 goal with a high proportion of advanced fighters is poor. It is stymied by serious constraints on India’s defense budget, the impediments imposed by the acquisition process, the meager achievements of the country’s domestic development organizations, the weaknesses of the higher defense management system, and India’s inability to reconcile the need for self-sufficiency in defense production with the necessity of maintaining technological superiority over rivals. The IAF is attempting to reach its desired end strength by acquiring the Tejas Mark 1 to beef up its lightweight segment, filling out the remainder of its Medium Multirole Combat Aircraft (MMRCA) purchase in its medium-weight segment, and continuing with the Su-30MKI acquisition and the PAK-FA co-development programs to sustain its heavyweight segment. All three tiers of the IAF are currently in trouble. The Tejas Mark 1 is handicapped by significant technological deficiencies; the prospects for expanding the MMRCA component to compensate for the Tejas’s shortcomings are unclear; and the IAF’s reluctance to proceed fully with the PAK-FA program could undermine its fifth-generation fighter ambitions. India needs to safeguard its regional air superiority over both Pakistan and China by mustering the requisite end strength and enhancing its extant operational advantages. The IAF should revisit some aspects of its current approach. It should be cautious about expanding the Tejas acquisition beyond six squadrons and consider enlarging the MMRCA component with the cheapest fourth-generation-plus Western fighter available. India should also reassess the decision to develop the Advanced Medium Combat Aircraft indigenously and avoid weakening the collaboration with Russia on the PAK-FA program. pilots with the best fighters available. The writer has twisted the facts to prove that IAF needs major modernization and inductions; creating bogey of combined China - Pakistan threat. Only proves how good Indian he is. LOL! 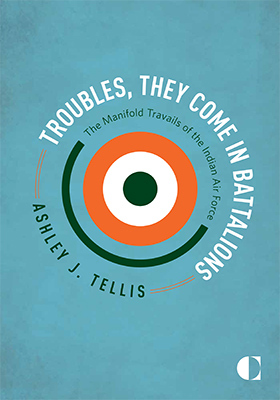 Mr Ashley J. Tellis is American, not Indian.
" Indian policymakers must especially guard against the temptation to prioritize indigenous design and manufacture over the imperative of providing the IAF’s able pilots with the best fighters available." - I could not read after this. The author is surely a lobbyist and not a researcher. The author is just saying India should buy the out of date F16 and nothing else. Mr Tellis is absolutely correct. Long selection procedures, procurement delays, protracted negotiations and reluctance to go for fourth generation fighters is a problem. Politicians are poor planners and worse decision makers. The 'make in India' slogan is a political gimmick and a wild goose chase. PAK-FA in large numbers (around 250) supplemented by around 300 to 400 F18s or similar fighters should be fine considering that SU 30MKI already are in the inventory. Tejas Mk2 and Mk3 should bring up the rear. Thirty six Rafales are neither here nor there. F16 and F18 are fourth generation fighters and will soon go in obsolescence. PAK FA is not a true 5th generation and only marginally better then SU-30 for frontal stealth shaping and internal weapon bay. India should buy more SU-30 MKI, improve them to Super Sukhoi standard, cancel Rafale order and buy 100 F-35 which are lot cheaper than Rafale. Take US help in developing AMCA. buy more Tejas Mark1-A to fill lower spectrum of fighters, continue developing better Tejas Mark2 and Mark3. We need together we can change world for life in community! Excellent article, btw India would buy f16 and or f18 if there is TOT. Total utter rubbish, based in great part to a great deal of bias against the Tejas. Similar empty weight to a Gripen C and similar engine thrust and yet lower thrust to weight ratio than the Gripen? Does this guy think we are all idiots who don’t understand basic physics? Comparing it to some unknown fighter like the J-10 whose specifications are not even released publicly, while extolling it is very disingenuous. Shamefully poor stuff.